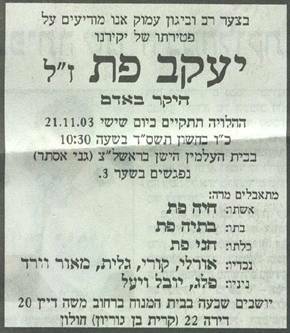 It is with great sorrow that I inform you about the death of Yaacov Patt z"l on Heshvan 23, 5764 (November 18th, 2003). Yaacov Patt was very active member in the Israeli Bialystok Landsmanschaft for tens of years. He was the master of the annual remembrance assemblies for Bialystok and its area for many years. Yaacov Patt z"l was the author of the Yizkor book of Suprasl "Life and Death in Shadow of the Forest" (posted at JewishGen: http://www.jewishgen.org/Yizkor/Suprasl/Suprasl.html and my web site: http://www.zchor.org/suprasl/suprasl.htm ). Yaacov Patt had an exceptional personality. He immediately gave permission to post the book in JewishGen, understanding the importance of the Internet media although he belonged to another generation. He was a noble person, wise, modest, patient, lover of the people... Blessed be his memory and his legacy will not be forgotten. Dedication ceremony of the Forest planted in memory of Suprasl martyrs in the Jerusalem mountain, May 1953. 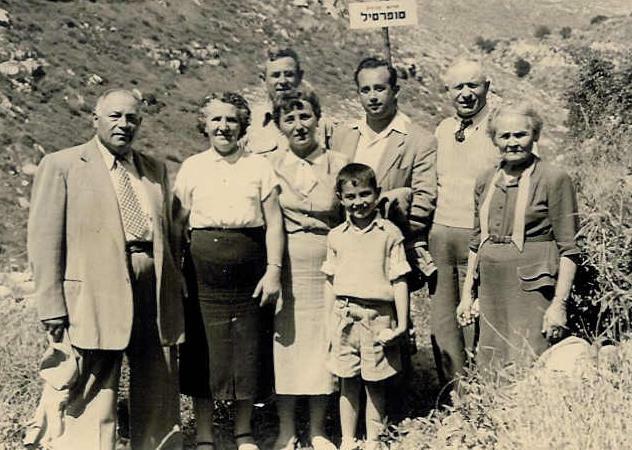 Third from right is Jakob Pat and the child is his son Boaz z"l, 9 years old. RE: A SYMBOLIC MATZEVA IN TREBLIBNKA TO THE SMALL JEWISH COMMUMITY OF SUPRASL! Unfortunately there is no symbolic stone for SUPRASL in Treblinka! 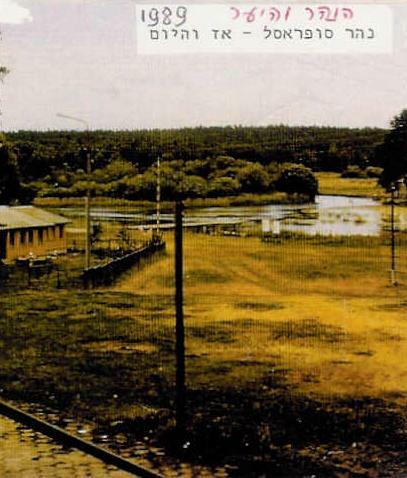 In the book "Life and death in Shadow of the Forest", by Yaacov Patt, Tel Aviv, 1991, there is a detailed account about the extermination of the Jews of Suprasl in Treblinka, after they were expelled to the Bialystok Ghetto, to the 10th army camp! The liquidation was on 21.11.1942. I kindly request from you, to add a symbolic stone to the memory of SUPRASL Jews. I send you my heartfelt thanks in advance for SUPRASL Matzeva as well as for all your endeavors to keep the memory of the miserable Jewish victims of Treblinka and the message to human kind: NEVER AGAIN! A TOWN IN THE BIALYSTOK DISTRICT, NORTHEAST. Written by Yaakov Patt, based on various sources. Suprasl, on the banks of a river of that name, is situated sixteen kilometers northeast of Bialystok, surrounded by virgin forests. The settlement was founded in the 16th century, and a church and a monastery were built there by the first settlers. On a map from the end of the sixteenth century, the place already appears as a town. It became known for its printing press, which was established next to the monastery at the end of the 17th century, printing documents on the subjects of religion and language, in Latin and Polish. It was noted particularly for the "Codex Supraslensis", a manuscript from the 11th century written in ancient Slavic. The first Jews came there from Lithuania during the first half of the 17th century. Subsequently there followed Jewish refugees fleeing from the disturbances of l648 (the Cossack Revolt under the leadership of Chmelnizki); at the beginning of the 19th century, following the partition of Poland (1772-1795) and with the annexation of this area by Prussia, Jews from the west also settled in Suprasl. In 1857 there were 227 Jews living in Suprasl and within twenty years they already numbered 530 (out of a population of 3,091), even though official permission for their dwelling there was issued only in 1903. At the end of the 18th century a wooden synagogue was erected, and an additional synagogue, of brick, was built in 1870. In the construction of this synagogue stained glass was incorporated into its windows and ceiling, and the symbols of the twelve tribes were painted. The building was surrounded by birch trees and a boulevard of trees led up to it. The ritual bath house, (the Mikve) the house of the Rabbi and ritual slaughterer and the school were in the vicinity of the new synagogue. In independent Poland, bethtwo world wars, there was a local Hebrew school of the 'Tarbut', clubs, and lectures forthe whole community took place, in its premises, as well as a library named for I.L. Peretz and an active drama group. A factory for the manufacture of cloth, established in 18near the monastery com, was the beginning of the textile industry in Suprasl; its founders were the Germans Zechert, Reich and Bucholtz. By 1857, there were already seven textile factories in existence, which together employed 1,019 workers. Although the town's inhabitants also earned their living from trading in lumber, and although there were several local flour mills, Suprasl was already known at the end of the 19th century and beginning of the 20th for the strikes of the textile workers and their occupational struggles, which had political overtones. At the beginning of the 20th century, when the textile industry in nearby Bialystok was almost completely in Jewish hands, Jews in Suprasl also began to develop this industry. The Zitron family of Bialystok acquired the Suprasl cloth factory from the Bucholtz family and made it the biggest one in town and in the vicinity. At its peak, the factory employed 1,300 workers. The Hirschhorn brothers established a factory for fabrics and blankets, employing about 120 workers, and this factory's generator supplied electricity to the whole town. A factory specializing in the dyeing and finishing of textiles was established by the Kkrinsky brothers, and 75 Workers were employed there. After World War I, the Jews also initiated the development of wood processing and marketing. The Hazan, Danzig, Gottlieb and Samitizki families built sawmills, and were aided by the convenient location of the town in the forest and river area. In the factories Jews worked alongside Christians; the work managers were usually of German extraction (they were the first experts in the field of textiles), the Jews worked in vocations which demanded professional skill, and most of the workers were Poles. In addition to all these, Jewish artisans such as tailors, shoemakers, fur processors, bakers and butchers were also present in town. Most of the shops were owned by Jews. The communist revolution and the Balfour declaration (1917) brought a new spirit to Suprasl, which until then had been dominated mainly by religious and traditional circles. Branches of the whole spectrum of the Zionist movement were founded there, including those of the Zionist youth movements. In villages near Suprasl, training centers were Established -or pioneers, graduates of all the Zionist youth movement, in anticipation of their emigration to the Land of Israel. Only a few people of Suprasl managed to migrate. The last one to go directly from Suprasl to the land of Israel was Yaakov Pat, who succeeded to immigrate in 1939, just before the outbreak of World War II. Between 1930 and 1939 Joseph Goldschmidt, a representative of the Jewish community, served as a member of the local Council. On the eve of World War II there were 600 Jews out of a total population of 3,000. After the outbreak of World War II (September 1,1939) and Subsequent to the Ribbentrop-Molotov agreement, the eastern Area of Poland came under the rule of the Soviet Union. Factories and private shops were nationalized and there was a shortage of basic necessities in the government shops. A week after the German attack on the Soviet Union (22 June 1941) the German army entered Suprasl and camped in the town. Jews were arrested on the streets and taken to forced labor, Jewish women were employed as servants of the German officers, Jews were persecuted, their property and money stolen, and there were also incidents of murder. The Germans removed the torah scrolls from the Holy Ark of the Synagogue, burned them and forced a group of Jews to dance around the bonfire. The community's Rabbi, Rabbi Shlomo Avigdor Rabinowitz was shot dead. Afterwards the synagogue building was blown up. A Judenrat (a Jewish council appointed by the German authorities) was established, headed at first by Rabbi Meyer Pat, and later on by the engineer Glicksman. The brothers Joseph and Shaul Goldschmidt were also participants. The town's Jews were left in their houses and not put in a Ghetto. On November 1, 1942 the Germans commanded the Jews to gather in the Market Square, but most of the Jewish families fled to the forests and stayed there several weeks, in spite of the cold and snow. Because of a calculated German trick, in which the Germans gave proper treatment and showed a humane attitude towards the first family that had to return because its children were ill, the other families returned to town. A group of youths under the leadership of Deidush Fine remained in the forest, organized itself there, kept in contact with the Jewish underground in the Bialystok ghetto, and finally joined together as the "Kadima" section of the Partisan. The Jews of Suprasl were taken to Bialystok, concentrated there under inhuman conditions, in buildings abandoned by the Polish army (the camp of the tenth brigade), together with Jews from other places in the Bialystok district; and on November 21, 1942 they were taken by train to the Treblinka death camp and murdered there. Several Jews, who had left the forests because of the harsh winter, returned to the Bialystok ghetto, They joined the underground there. They fell fighting in the revolt of the Bialystok ghetto that broke out on August 16, 1943.